I never really thought I would start a blog - let alone a blog containing not one, but two (and counting?) posts about Smurfs. It's just that moving to Belgium is bringing up a treasure trove of childhood memories. The other day, I was researching the difference between transformers and converters, which I still can't say I completely understand. But then I recalled learning at least one part of the lesson the hard way, back in the day. We had just moved into our new house in Roosendaal, the Netherlands. I must've been about 9 or 10 years old. Even though I was a girl, my room was decorated according to a (not-atypical in Euroland) red-and-white Formula One theme, straight out of the Ikea catalogue. I think the prior inhabitant, a boy, had slept in a racecar bed. Nevertheless, I loved my room and did not yet resent my parents for being Chinese and uninterested in ameloriating or personalizing interiors. 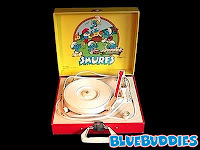 One day, I decided to play a record on my Smurfs turntable, which had been carefully shipped from the U.S. I had watched my parents use the converter with their grown-up devices, and figured it would allow me to do the same. Unfortunately, shortly after plugging it in, the record player began to emit smoke before basically exploding in my red-and-white room. Lesson learned: Do not use converters on appliances better served by transformers. And identify which is which.